Hello Readers! 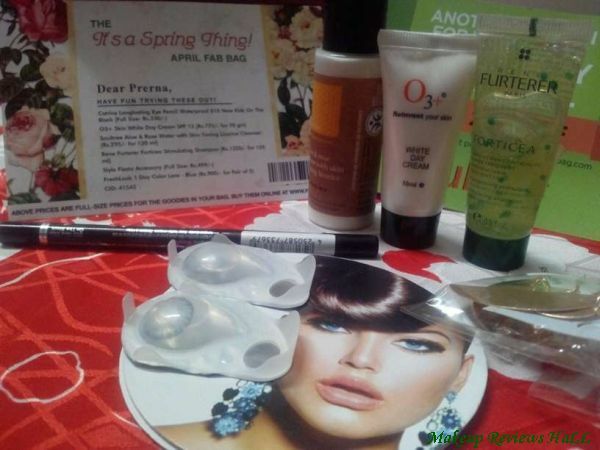 Super excited to share this month’s APRIL FAB BAG with you all, since this time there is extra stuff than the regular and something very very unique. I know you are already anxious to know more about this April Fab Bag products and contents, so without wasting any time, let me give you look at the bag and its products. This months April Fab Bag comes in a pretty pink color, nothing fancy just plain, simple and cute looking pouch indicating the beautiful spring time. As mentioned above this time there are some extra goodies unlike regular 5. 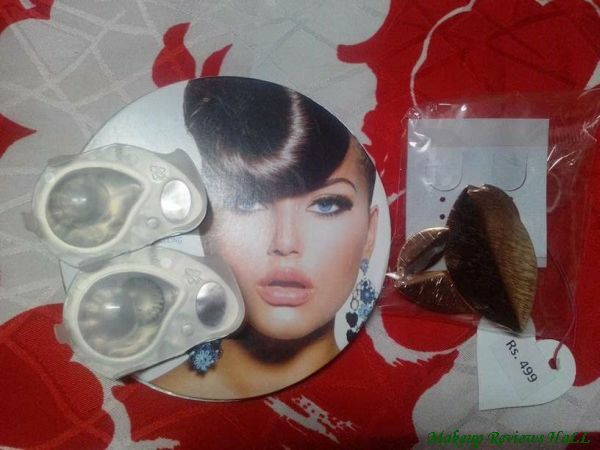 There are 6 items in the bag which includes a very unique product, which I have never bought till now and never ever thought of buying, its EYE CONTACT LENS in BLUE. Yes this is the product which has excited me the most since I would have never thought of trying a colored lens but great to find this in this month’s bag. Lets take a look at the products individually. This is my favorite product of this month because I chose this on my own. I have been searching for a smudge free waterproof eyeliner since almost a decade and still the search is on because very few brands stay up to your expectation when it comes to eyeliners, kohls and kajals. Though Maybelline & Oriflame are few of these which I always buy again but I am still searching for the best smudge free kajal in India. Lets see if this Catrice makes up for the search. I think there could not be a better time to try whitening creams and sunscreens than the hot sweaty summers. 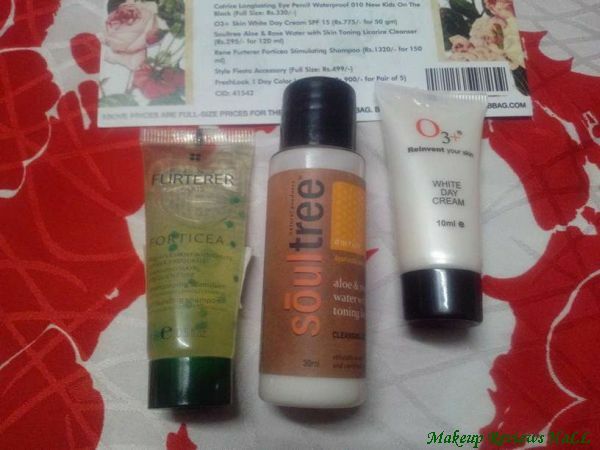 Though I normally avoid skin whitening creams but use them ( which is very rare ), only after I develop a tan or its extreme summers for protection. So yes it would be a great option to try this sunscreen this summer season. This brand and the specified product is totally new to me. I don’t understand its name completely but think its for stimulating hair growth for thinning hair. I have been benefited from few recently used hair products, because of which my hair have started growing again but still like to try this new brand for the problem of hair fall and thinning. Would soon update my experience with this shampoo once I try this. These are the two accessories received in Fab Bag, this month. The earrings in Gold look extremely pretty and stylish to flaunt your attitude, which I always love doing. The next thing i.e the colored lens in blue, is the shade which I opt for because this is the eye shade which has always fascinated me and I always wondered how this shade would look on me. Though I am little sacred to try these eye lens, because its something I have never tried before and has to be put in to your eyes, but keeping the branded item in mind, I would surely give it a try very soon, with the pics uploaded. So this was all about my Fab Bag April 2016 and the goodies in it, which I am already loving very much. 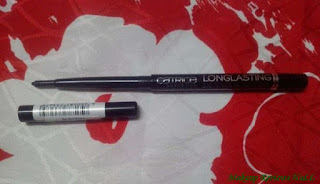 I am very much excited to try most of its products specially the black kajal. I guess looking at the amazing stuff of the bag, most of you would be all set to subscribe for the lovely goodies which come as a surprise every month to add more colors to your beautiful life. Except for the shampoo, I received all the same products. This is also my first time to try out the colored lens so I am scared and excited at the same time! I'm liking the eye pencil and cleansing milk. The pink pouch also looks pretty.